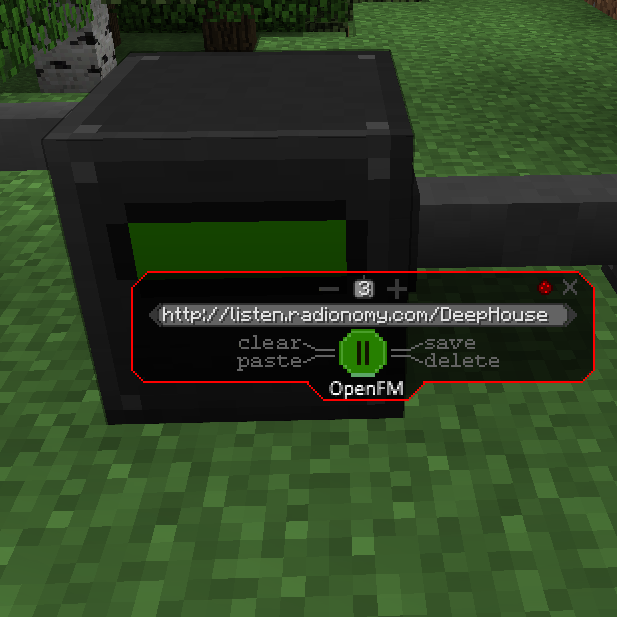 Streaming radio for Minecraft, with OpenComputers, And as of Build 19 ComputerCraft support. fm.setScreenText("Text to display on radio") --Text will scroll if larger than the display. Highly modified version of Dragon's Radio Mod, Dragon's Radio Mod is Licensed MIT. You are free to use this mod in your modpack! MAJOR THANKS to gamax92 in #oc who rewrote the entire network system for 1.8.9+ and many other bugfixes, without him 1.8.9+ wouldn't have been done. It seems Radionomy has started to require the use of their player to play their streams. Any stream that plays mp3 or ogg music streams should work though. Hey can you add support to stream soundcloud if it is possible or maybe youtube videos for sound? Hi I have such an interesting bug with GalactiCraft. My English is bad and I use Google Translate. To the essence. When I'm in the main world (OverWorld, earth) then there is a redstone mode, which as an icon in the upper right corner is there. BUT !!! When I move to another dimension (Space Station, Mars, Moon, and so on), this icon disappears. It's just not there. Thank you for your help earlier. Bye! Sorry for the super late reply, yes that was the intended behavior redstone mode only worked well in the overworld... I may revisit this later. This mod is mainly a OpenComputers addon, as such it relies on OpenComputers to be stable, and OC for 1.11 is anything but. So no, I've not ported it yet. As for it being dead, just because I've not updated it doesn't mean it's not maintained, it's not broken, and I have no new features to add so I've not released an update. Uh, sorry, i didnt thought about this OC requeriment. Is there any alternative for 1.11.2? It depends on the source format, if they output MP3, or OGG streams directly then it will work, I've never looked into iHeartRadio streams. Soundcloud is very unlikely since they use a custom player. I have just installed this mod on a FTB Direwolf20 server, running on v. 1.10.2. All players have the mod installed in their clients as well. I have placed the radio ingame, set up a pair of speakers, but no matter which radio stations I try out, nothing happens when I clock the play button. Everything else seems to work fine. I checked that the Ogg and MP3 .jar files are ind the mod folder, both on the server and locally. I'm running on Windows 10, using Java 8. Any Ideas as to why I can't push play? I'll need example stations tried, and As much operating system info as possible, pastebins of log files is helpful too. Any chance for 1.11.2 support? This mod sounds great. I highly doubt this will ever happen or even be possible. But is it possible make the client not require it if installed on the server 1.7.10. We are using a Modpack and I love this one a lot but sadly not everyone will install our client addon and we don't want to start forcing it now. i can't seem to get the demo stations or http://64.12.61.6/stream/1022 station to play.